Easy Poster Printer is a free program for Microsoft Windows that you may use to create posters out of any image on the system. While you can print any image or photo on your computer if a printer is connected to it, there is no option to create posters out of those images by default. While you can use specialized printers for that, you may also use a program like Easy Poster Printer instead to create posters using regular printers. 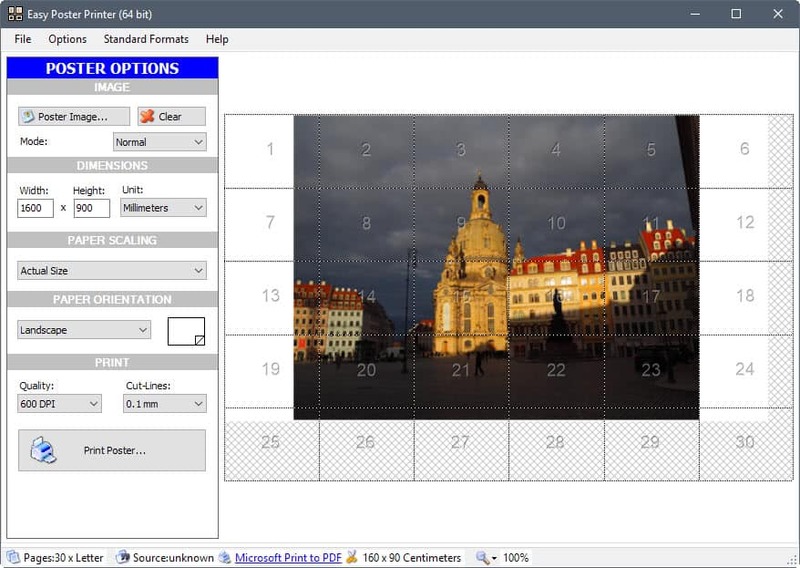 The program offers similar functionality to long-standing favorites such as Block Posters or Rasterbator. Easy Poster Printer is compatible with all supported versions of the Microsoft Windows operating system. It is offered as a 34 Megabyte download that you need to install on the system before you can start using the program. The interface of the program is divided into two main parts. The left sidebar pane, called Poster Options, lists configuration options, the right pane a preview of the sheets that are used to create the poster. Easy Poster Printer was designed to create posters on regular printers. It achieves that by using multiple sheets instead of just one. The process itself is straightforward. It begins with the selection of an image that you want to turn into a poster. The quality of the image plays a role here, as the quality will suffer if the source image is of low quality already. The image is loaded as is by default, but you may switch to zoom or stretch modes instead. Since you do get a preview of the output poster as soon as you may a change, it is pretty easy to find the right settings. You may use the Standard Formats menu to pick a desired output size right away. This ranges from A0 to A3, and B0 to B3 by default. You can add your own custom formats to the program, and load them whenever you create new posters. Handy if you want to print posters that are larger than the largest standard format the program has in its formats database. Dimensions -- This defines the total dimensions of the poster. Easy Poster Printer supports posters up to a size of 20x20 meters. Paper Scaling -- Choose between actual size, or scale up/down. Paper Orientation -- Choose between portrait and landscape mode. A right-click on the preview area displays a context menu full of additional options. You may rotate the poster, flip it, or open the image and text editor to add text to the poster. Once you have customized the poster options, you may hit the print poster button to start the printing process. The program may send the job to any printer connected to the device, or save it as a PDF document using Microsoft's Print to PDF virtual printer. Easy Poster Printer supports a preview option as well when it comes to printing. Instead of printing all sheets right away, you may alternatively print a selection only. This is done by selecting sheets in the preview area, right-clicking on the selection, and selecting the print selection option from the menu that opens. Handy to make sure the quality is alright at the very least. Easy Poster Printer is a comfortable to use program that may turn any image into a poster for printing on standard printers. The program displays a handy preview of the poster in real-time, and supports printing a sample of the output only to make sure all settings are appropriate. Is your Excel approach potentially better because you can manipulate the data to get a higher smoother effective DPI?